Have you enter our Halloween special already? No? You have time until tomorrow, 23:59, 30th October 2009 GMT+1. We already received some great photos! 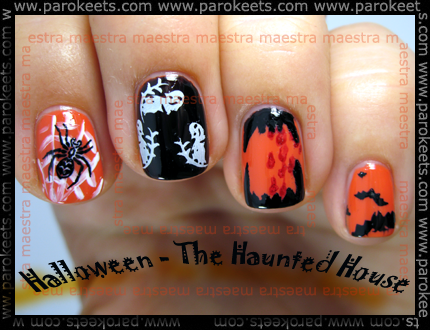 I really hope there will be more and Halloween is going to be special with all your photos of Halloween manicures posted on our blog! Ladies (and gentlemen), please, don’t be afraid to enter. Send us your photo of a Halloween inspired manicure! Every single photo is special to us!. 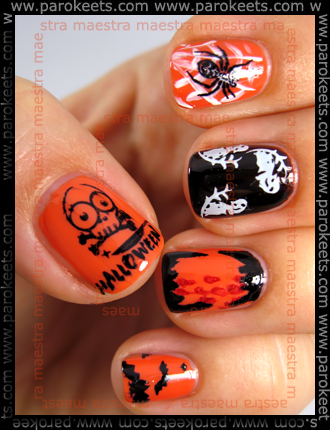 Everyone has its own idea about Halloween manicure. Show us yours! Let this be a inspiration for you (or not, however you want it :D ). I really hope I convinced at least one of you to enter out contest! I can’t believe it’s almost Hallooooooooweeeeeeeeeeeen!!! :skll: Love that manicure. Great pictures on the nails. I just did one hand orange and the other black. I used the WetnWild Fantasy Makers with the bar glitters. I’m not to thrilled with this. I probably will take it off and try something else. Maestra, od kod pobiraš ideje?